A toddler is held up to the camera in this still image taken from video said to be shot in Madaya on Tuesday. Warnings of widespread starvation are growing as pro-government forces besiege the opposition-held town in Syria. 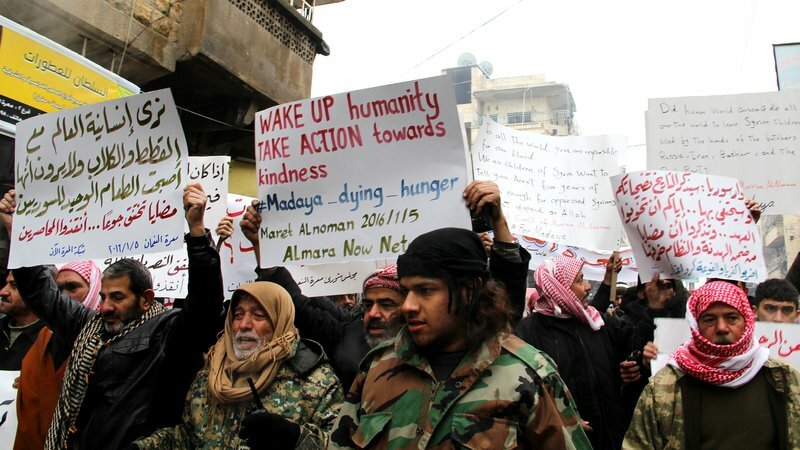 Demonstrators in Idlib, Syria, protested Tuesday on behalf of civilians starving in the besieged town of Madaya, Syria. Three besieged towns in Syria will soon be receiving humanitarian assistance: The Syrian government said Thursday it will allow aid to enter the villages, after multiple organizations reported deaths from starvation. Bashar Assad&apos;s government is permitting aid to Madaya, which has been under siege by the regime since July, as well as Foua and Kfraya, two villages adjacent to each other that have been besieged by anti-government forces for more than a year, the Associated Press reports. There have been recent reports of deaths from starvation in both regions in recent weeks — but particularly horrifying dispatches from Madaya. "While the pro-regime villages get sporadic airdrops, Madaya is cut off," NPR&apos;s Alison Meuse reported for our Newscast unit. Madaya, which is on the Lebanese border, has also been besieged by Hezbollah, Alison reports. The U.N. has received "credible reports" of people dying of starvation in Madaya — or being killed when they attempt to leave. More than 40,000 people are in the village, which last received food aid in October, the U.N. says. On Wednesday, The Guardian published accounts from residents of Madaya who described families eating leaves, grass and pets to survive. "It was not possible to verify their claims because of the siege, but several independent accounts were consistent in describing life in a town desperately short of food, medicine and electricity." The U.N. welcomed the news that aid will be permitted, saying in a statement the organization is preparing humanitarian assistance to be delivered in the next few days. Doctors Without Borders, also known as MSF, said that since Dec. 1, 23 people have died of starvation at an MSF-supported facility in Madaya. "Madaya is now effectively an open-air prison," Brice de le Vingne, MSF director of operations, said in a statement. "The medics we support report injuries and deaths by bullets and landmines among people that tried to leave Madaya." Freezing temperatures and a lack of medicine are exacerbating the suffering from the siege, MSF says, calling for heating fuel and medical supplies to be included in aid to the village.